Gildar Gallery is thrilled to host a solo exhibition by the renowned painter Clark Richert titled Symmetry and Dimension. The show, the artist's first in two years, is curated in collaboration with Richert's longtime dealer Robin Rule. Running from November 15th,2013 – January 18th, 2014, the exhibit opens on the evening of Thursday, November 14th with a reception from 6pm to 10pm. Symmetry and Dimension offers ardent followers of Clark Richert and those new to his artwork fresh insight into this important artist's rigorous and visually stunning explorations. With a forthcoming essay by curator/critic and former MCA Denver director Cydney Payton, the exhibit unlocks new insights into Richert's uniquely consistent yet evolving historical and contemporary concerns. 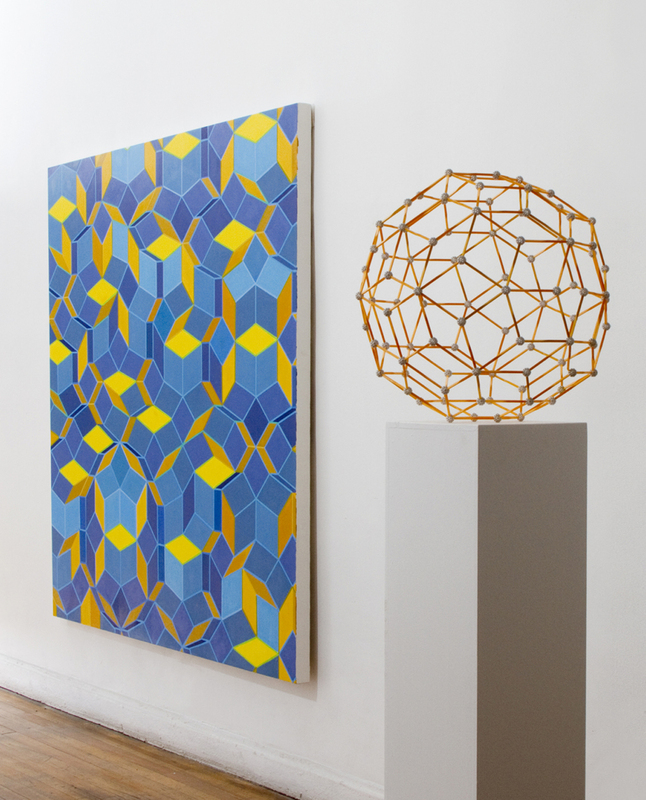 On display will be new and recent paintings, prints and a film–based object by Richert that illustrate abstract tessellating geometries and their application as multidimensional structures within artist lead communities. For nearly 50 years Clark Richert has envisioned – and at times predated– in paint what scientists have sought through empirical observation. Known for his colorful patternistic canvases, Richert initially found himself inspired with mathematical patterning in the early 1960's when he came across the efficient geometry and humanitarian ideals of BuckRminster Fuller's geodesic dome. 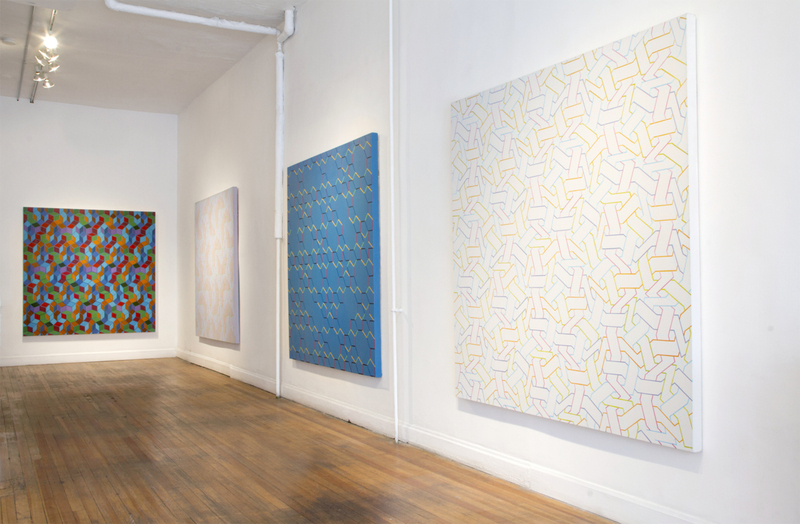 With a belief that pattern recognition is at the core of human understanding Richert began exploring new patterns in his paintings. He applied his discoveries in the construction of the famed art commune Drop City in southern Colorado, which he cofounded in 1965 with other likeminded artists Gene Bernofsky, JoAnn Bernofsky and Richard Kallweit. By 1970, Richert, who was intuitively observing shadows cast by three–dimensional forms, found that one such structure – the rhombic tricontahedron – placed under sunlight casts a shadow in the form of a two dimensional pattern made from tiling a pair of differently shaped diamonds. 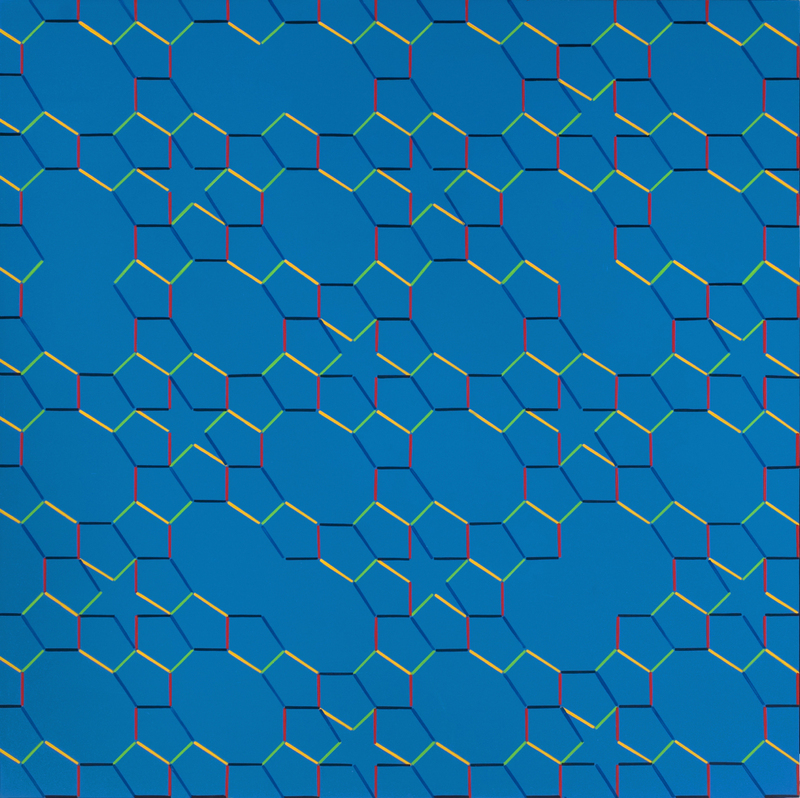 Richert noted that this pattern tiled across a plane never repeated itself. 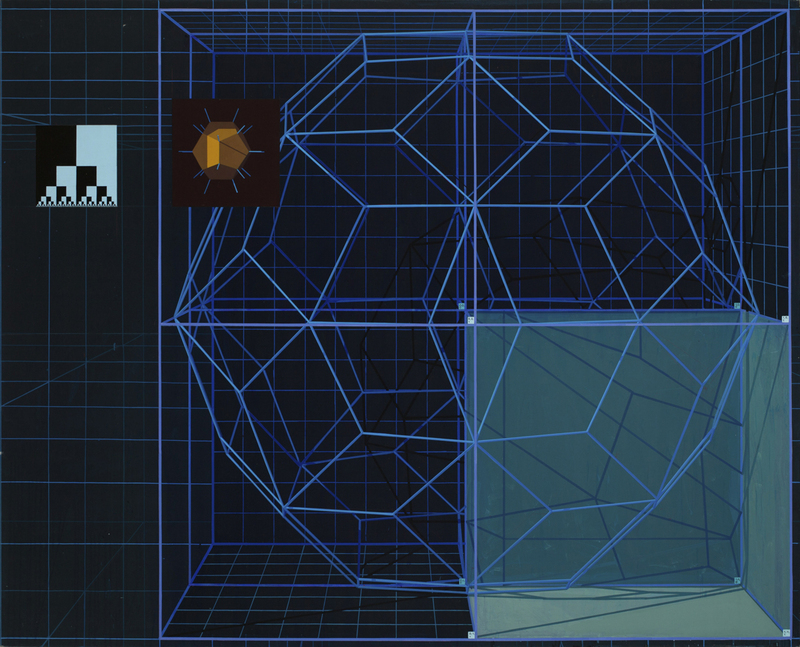 The resulting aperiodic tessellation included a number of shapes that exhibited five–fold symmetry; these forms could be perfectly superimposed upon themselves by rotating on a center point in five equal increments. This discovery broke with the long held rule that five–fold symmetry was strictly impossible for any two dimensional packing of shapes. This so–called forbidden symmetry became the main subject for much of Richert's paintings. To contextualize this achievement, skip ahead to 1976. Physicist Roger Penrose discovers this same non–repeating tessellation with five–fold symmetry dubbing it the now famous Penrose Tile. Later in 1983, through experiments with metal alloys, Israeli material scientist Dan Schectman finds this same structure existing in the natural world as the quasicrystal. This revelation breaks with the fundamental laws of crystallography, ushering in a scientific revolution and eventually earning Shectman the 2011 Nobel Prize in chemistry. 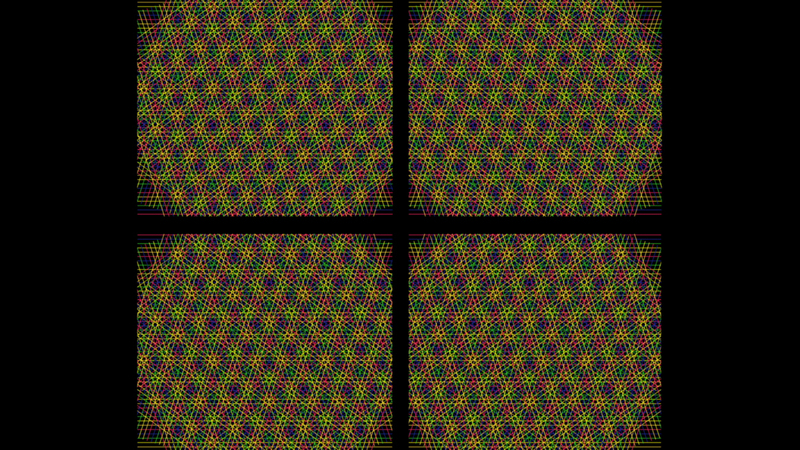 Richert's relationship to five–fold symmetry and non–repeating tessellations has not dimmed since his initial investigations; and he continues to search further for new patterns. Most recently, Richert has become interested in the quasicrystal properties of a 10 dimensional form called the enneacontahedron. A two dimensional view of this form occupies a selection of paintings and prints in Symmetry and Dimension. 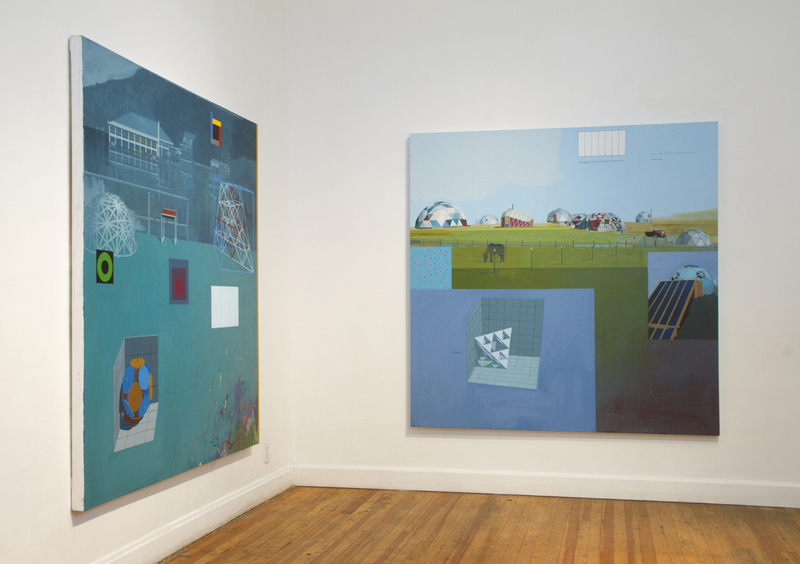 While certainly steeped in exacting methodologies, Richert's paintings can also be appreciated without a background in theoretical mathematics. As Richert observes, all humans are imbued with the powerful ability of pattern recognition. In this way his paintings offer a point of entrée to even the most casual viewers, who will find in his work surprising optical experiences. The paintings in the exhibit are accompanied by a film–based object made in collaboration with Richert and the production team No Norizon. 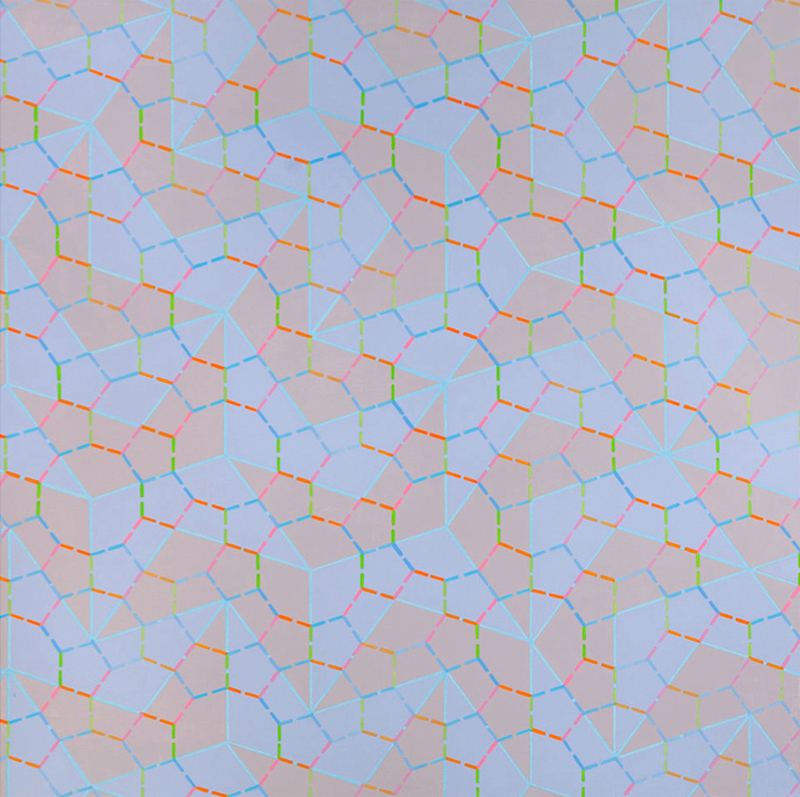 This projection on canvas illustrates the magnitudes of complexity that can be built from simple beginnings as a set of lines, rotated and layered on top of itself to create a latticed quasicrystal formation in a mesmerizing visual array. 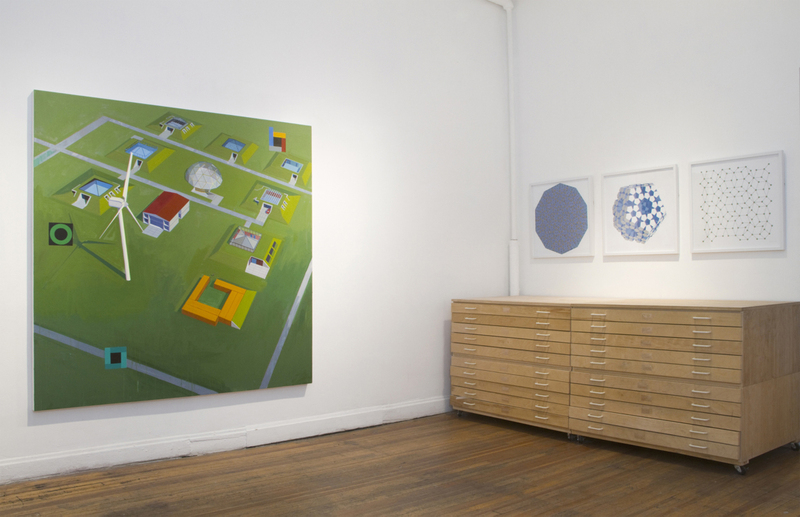 In addition to Richert's abstracted geometries, on display are a series of three painted landscapes. 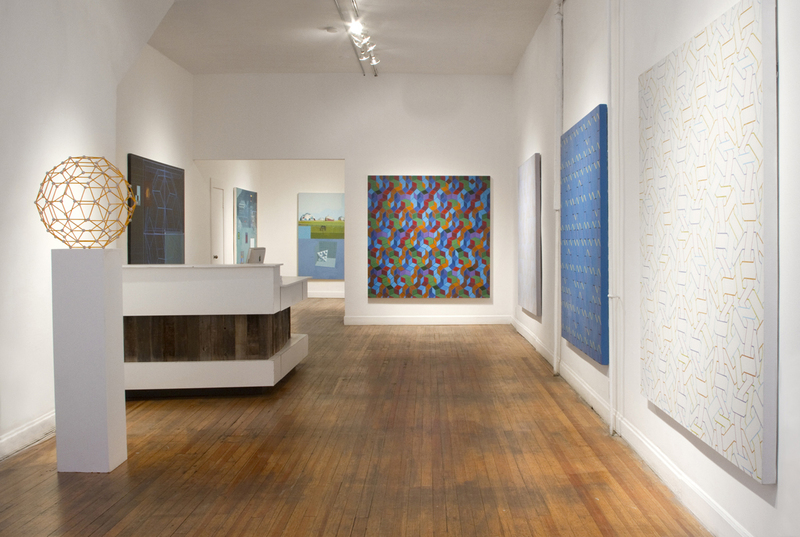 These paintings depict patterns applied to building structures within artist–run communities that have influenced Richert's thinking or been a product of his prodigious mind. 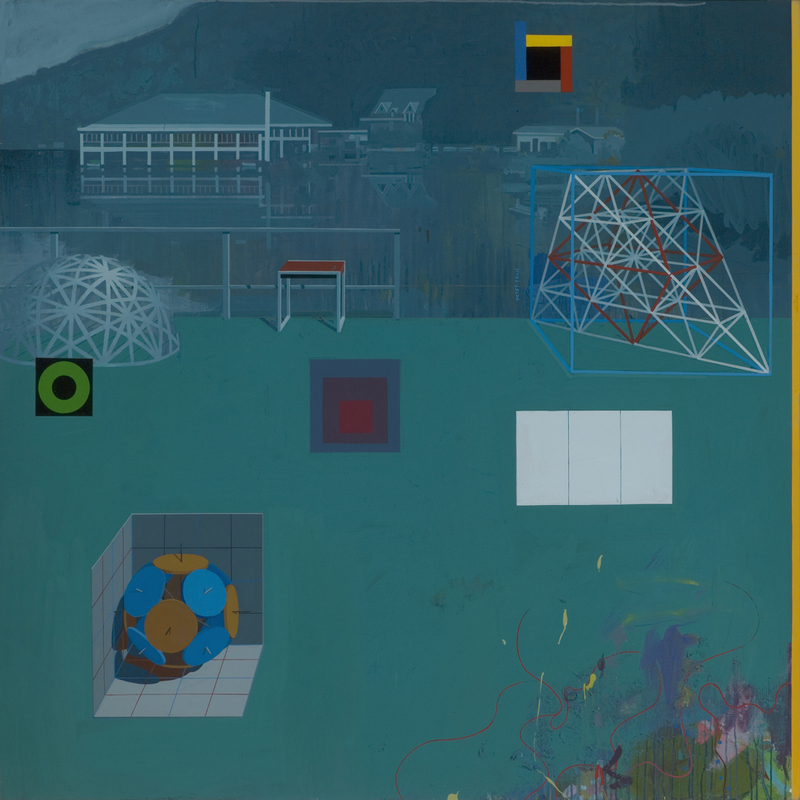 The first painting depicts Black Mountain College, the experimental school in North Carolina that ran from 1933 to 1957, attracting some of the most experimental members of that generation's avant garde – individuals such as Buckminster Fuller who built his first geodesic dome there. 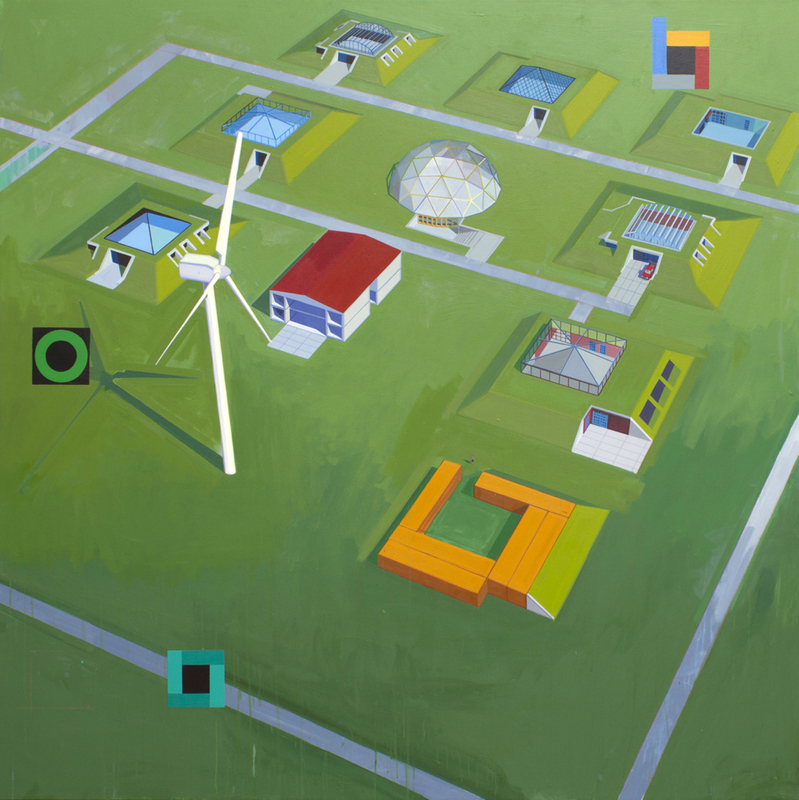 The second painting in this series reveals a view of Drop City and the variety of geometric housing structures built by Richert and fellow residents. These structures, based on Fuller's dome and Steve Baer's zonahedra, were built from recycled materials including wood, car hoods and bottle caps, making Drop City an early "green" community well before that term entered our language as an environmental buzzword. Since the disbandment of Drop City starting in the late 1960's, Richert has continued to seek out new utopian models leading him to develop the design for a conceptual community called the Artists Residential Environmental Area (AREA). In his third and last canvas in the landscape series, Richert paints AREA into existence with a hypothetical perspective of this new sustainable artist community and its earth–sheltered studio/domiciles. A resurgent interest within and beyond the region in Richert's work at Drop City sheds new light on this significant artist's achievements. Recently Richert's work has been exhibited in the traveling museum exhibit West of Center, which started at the MCA Denver and recently came to a close at the Mills College Art Museum after stopping at the Scottsdale Museum of Art and the University of Oregon Art Museum. Concurrently, the Drop City documentary has been released and screened at the PS1 MoMA dome in New York, where Richert spoke; and will be coming back to Denver for a screening at the Boulder Museum of Contemporary Art on January 16th. Richert was further recognized by the scientific community in the February 2012 issue of Chemistry in Australia, which acknowledged his early fivefold symmetry discovery in 1970. The essay accompanying the exhibition by Cydney Payton further unveils new perspectives on Richert's fascinating history and his relationship to current themes in contemporary art.